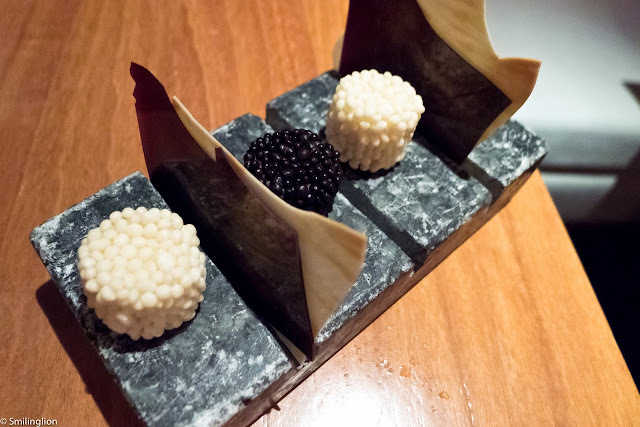 In the male-dominated US fine dining scene, there is understandably no little attention generated when a female chef attains the heady heights of being awarded two Michelin stars. 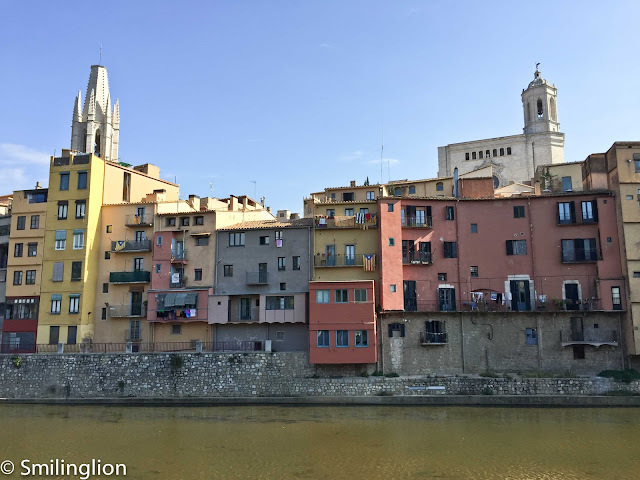 This is less of a novelty in places like Italy and Spain where the women have stood their own in their standing as top chefs (some examples include Elena Arzak of Arzak, Carme Ruscalleda of Sant Pau, Luisa Valazza of Al Sorriso and Nadia Santini of Dal Pescatore). 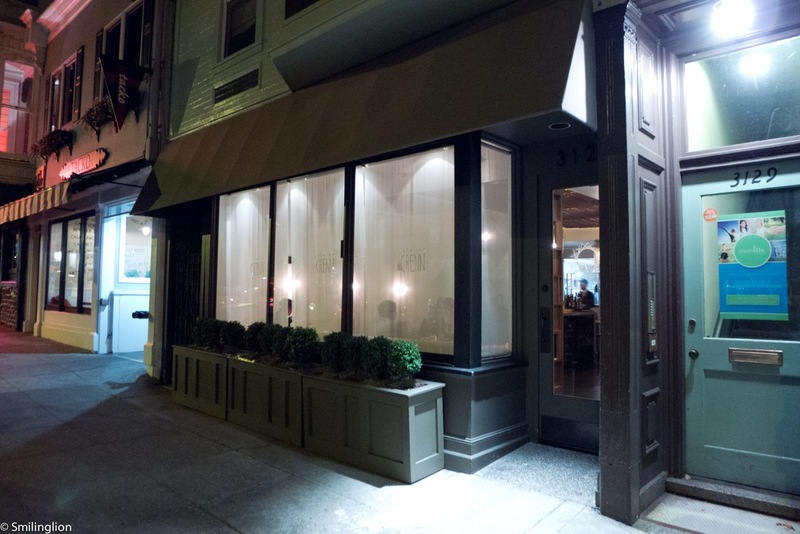 It is no surprise then that Chef Dominique Crenn, of her eponymous restaurant in the quiet and classy neighbourhood of North Fillmore Street, has been the talk of town (especially in the Bay Area) for the past years ever since her inventive and molecular cuisine was getting noticed by diners and critics alike (including the Red Book). 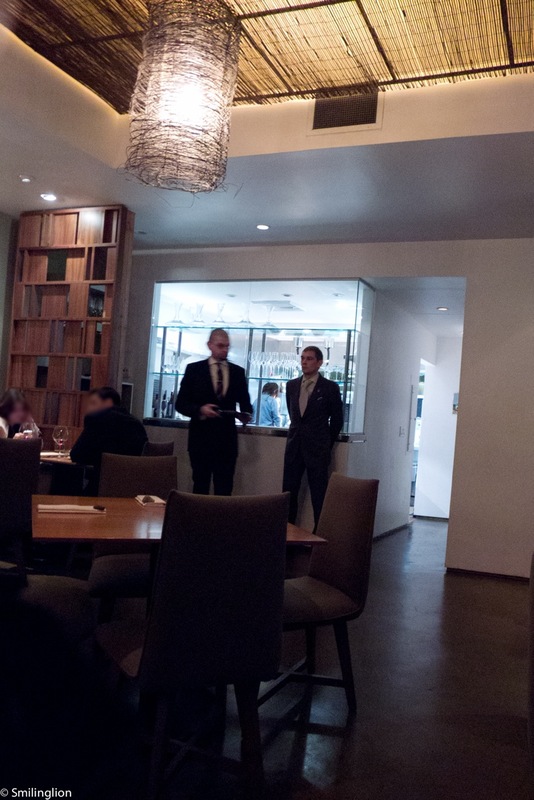 When we entered the restaurant, we were very surprised by the small size of the restaurant and the casualness of it. The row of tables against the wall where we were seated were packed very close to each other and were uncovered (surprising for a two Michelin starred restaurant, though that is not without precedent - the brilliant La Calandre also had uncovered tables when we dined there). Chef Dominique's entire cooking philosophy centres around her poetry, which couldn't be more obvious from her Grand Tasting Menu, which had 12 lines of words which described only in the most abstract sense what we were going to be eating that night. 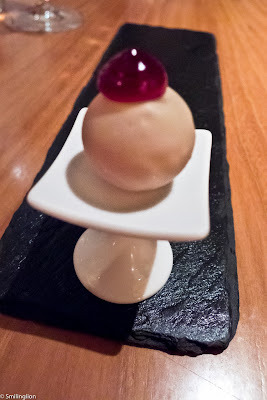 The tasting menu started without much fuss, and we commenced with a white chocolate sphere which when put in the mouth broke quite easily to release cold cider. It was quite the amuse bouche. The 'foam' dish didn't take long to make an appearance. This was a bowl of sea urchin with a lemon and liquorice foam. It was a quite interesting that the liquorice flavour only came out two seconds after eating the foam, although we thought the sourness of the lemon overpowered the dish somewhat. The 'bread' service was a buckwheat 'paper' which was quite brilliant and which we nibbled on the whole night. The celery and wheatgrass broth in this oyster and caviar dish brought out a herbaceous flavour which was very dominating. 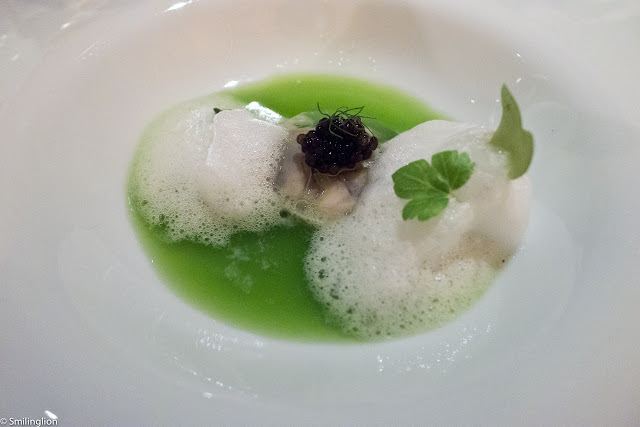 It was quite a unique blend of ingredients and instead of the broth bringing out the richness of the caviar, it was the other way around in this dish in that the brine of the oyster and caviar sought to balance out the strong wheatgrass taste. We liked the interplay of favours in this dish. 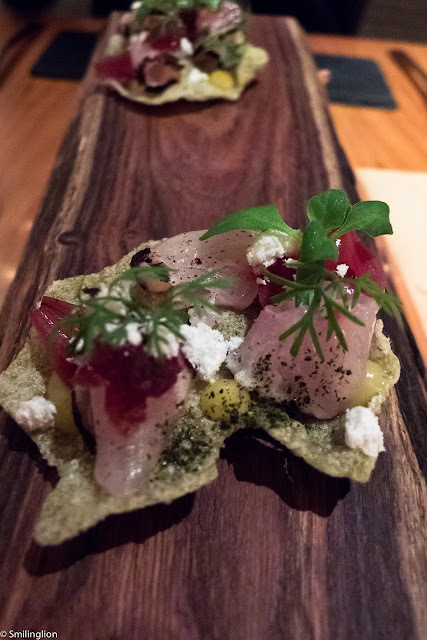 A less unusual dish was the rice cracker with raw mackerel flavoured with seaweed. It was good. The reconstruction of the french onion soup did not work for us. The thick onion soup was too salty and the strip of dried gruyere only managed to make it saltier. 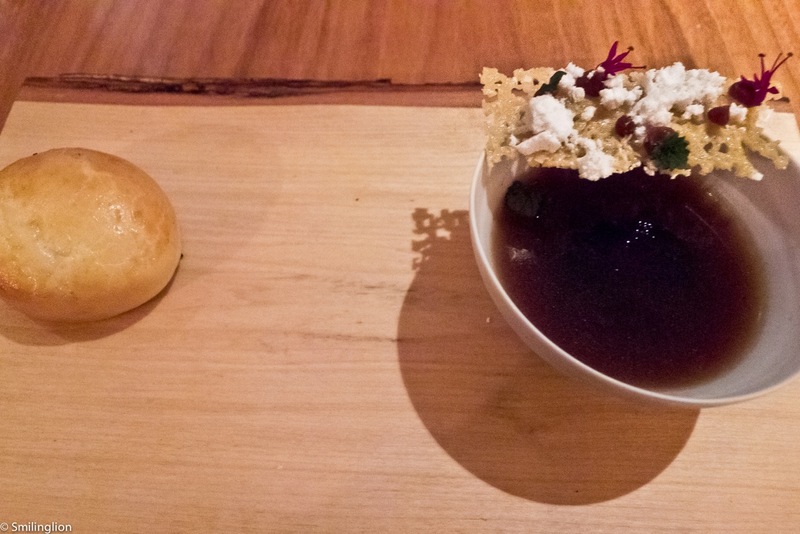 In addition, the soup wasn't hot and the accompanying brioche just did not go with the course. 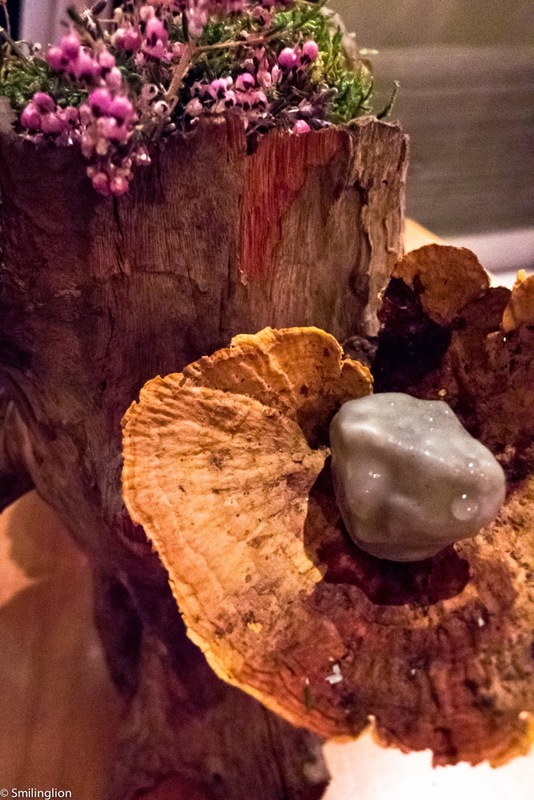 A giant stump then appeared on our table, from which we picked out another chocolate sphere (except it wasn't a sphere this time, but a misshapen blob) with a cold alcoholic liquid (don't remember what). It was refreshing. We weren't sure if there was anything else on the block of wood which we were supposed to pick off to eat though. The dish which looked the worst was probably our favourite. 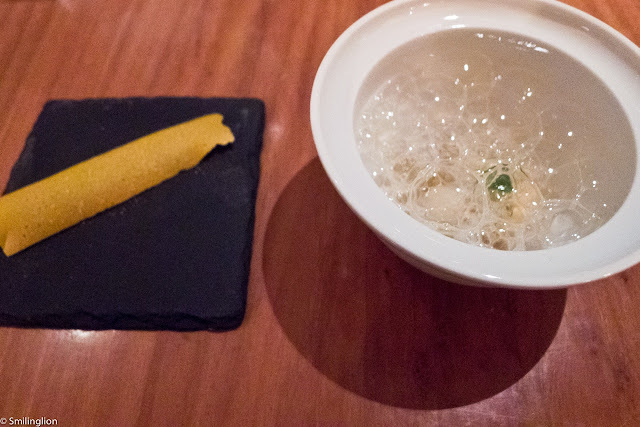 Quinoa soaked with a delicious broth full of umami flavours which were crunchy when we ate it. 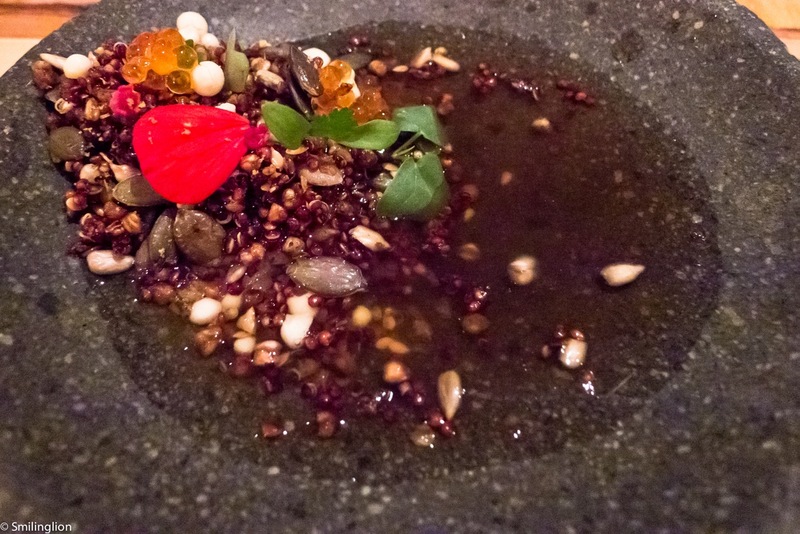 Texture-wise it was like eating granola in a savoury soup, but despite the weird composition, we really enjoyed this dish as the nutty flavours brought out by munching on the toasted grains somehow matched perfectly with the dashi broth. 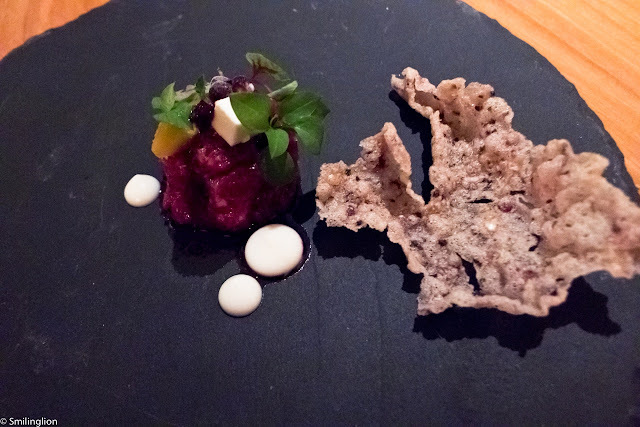 The lamb tartare was quite special (first time we have had raw lamb), although this was quite a simple dish. 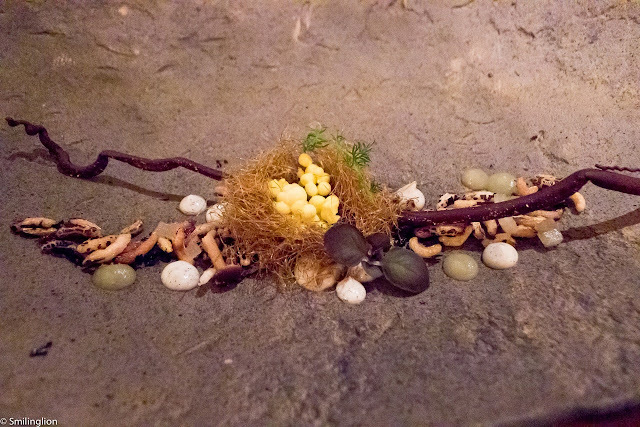 This was Chef Dominique's interpretation of the walk in the forest, which featured various herbs and ingredients which would give the diner the impression of being in a wild nature. The various mushrooms were nicely sautéed, although we felt that the use of balsamic vinegar at certain parts of the dish was too heavy. This was the dish which confounded us the most. 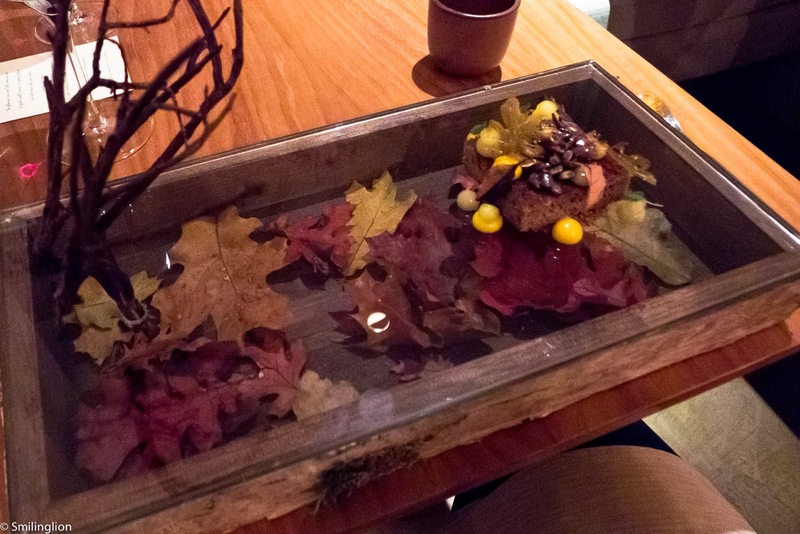 The plate of various dried mushrooms, herbs, chocolate sticks masquerading as branches and sugared balls which were supposed to be eggs was visually beautiful but tasted odd, especially when we had to alternate bites of this with a sip of a duck consommé served separately in a cup. The duck soup was too salty and we couldn't figure out how it was supposed to go with the predominantly sweet ingredients on the plate. 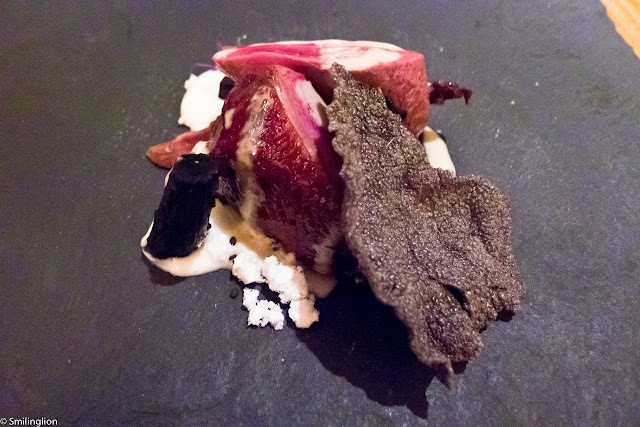 The final main course of squab was reasonably good but it did not stand out very much. This dish was crying out for a good sauce but instead it remained dry with a cracker and dehydrated cheese as accompaniment. The pre-dessert was really interesting. 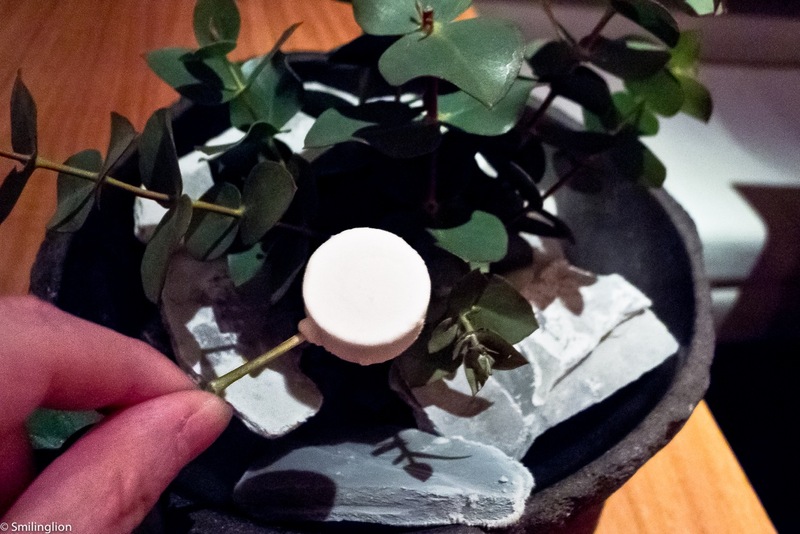 We were presented with a pot of eucalyptus plant which was full of fragrance, from which we picked out our stick of frozen eucalyptus sorbet. 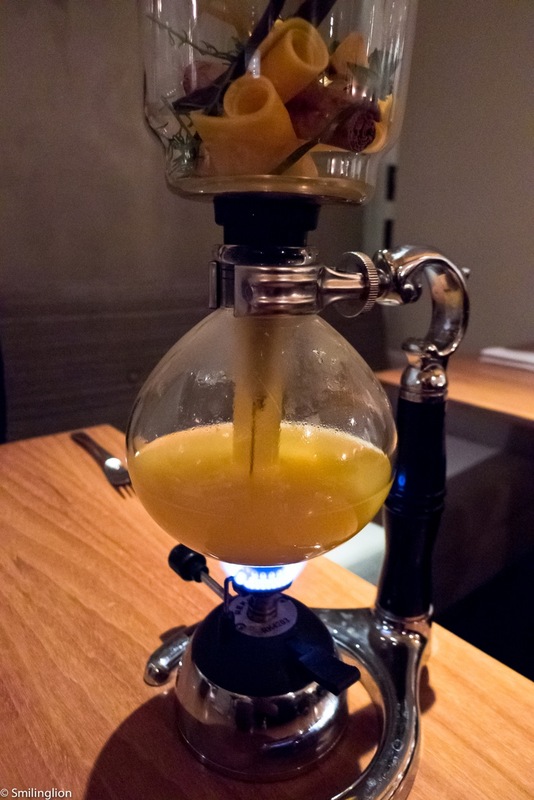 All this while, the server set up a coffee brewer but instead of coffee beans, butter squash and other herbs were used to brew a very rich sweet and herbal tea. 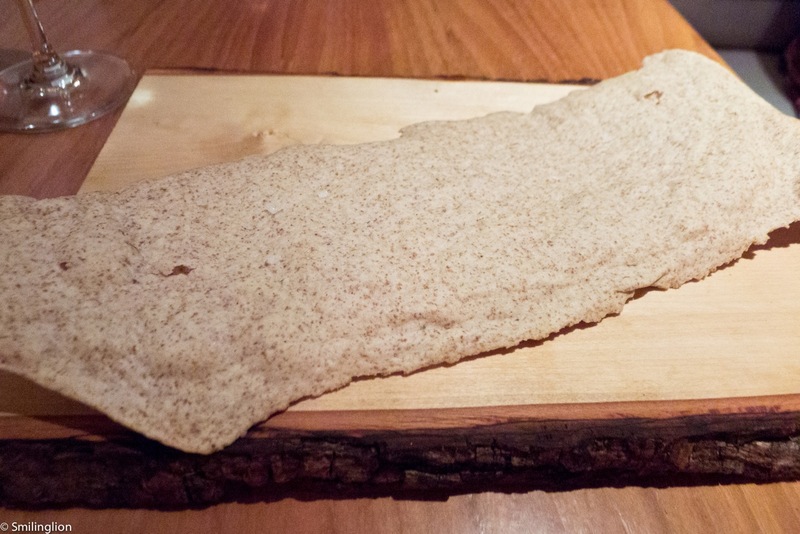 Dessert of a spice cake was presented on a box of leaves which reminded us of a similar dessert we recently had at Sant Pau. 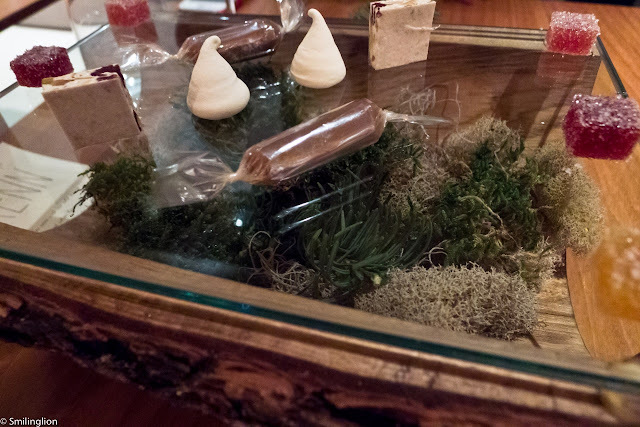 The mignardises continued in the same vein and were served on another glass box with some vegetation underneath. This is generally something we don't like, as the things under the glass tend to distract us from the dessert itself, and that was the case here, as we remembered neither the spice cake nor the mignardises. At the end of the meal, Chef Dominique came out of the kitchen to greet and speak to us. She was really charming and it was nice of her to interact with her diners. 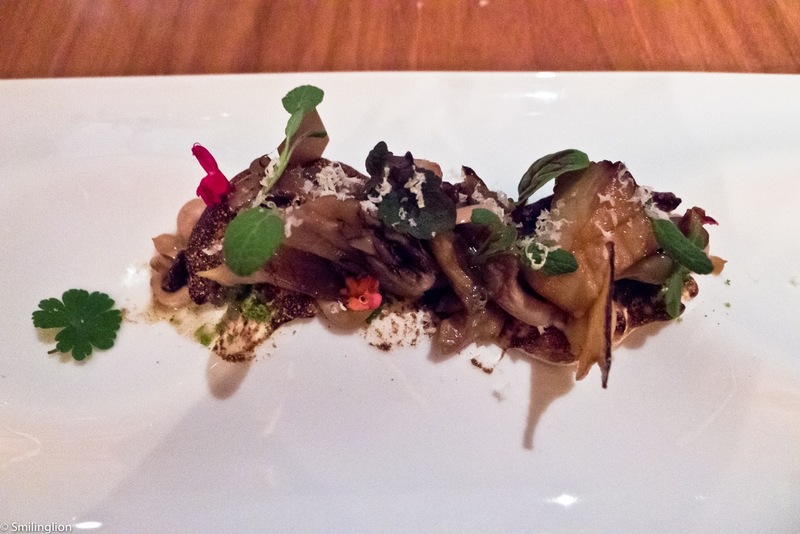 Impressions: There were some original ideas brought forth by Chef Dominique which intrigued us, but we felt that the meal was too inconsistent with a few dishes which we felt were either too ordinary or not up to the high standard we expected from this restaurant. In addition, we felt that for the chic and sophisticated cuisine intended by Chef Dominique, the interior of the restaurant was far too informal (and noisy) and the wait staff too brusque and inattentive at times (in fact, our server accidentally poured part of the soup on our table when presenting one of our dishes). To fully appreciate and immerse ourselves in the poetic culinary vision of Chef Dominique, we needed to be spared from distractions created by other guests sitting too close to us and from getting annoyed by the service staff. There's nothing I love more than being presented with something that I'm not sure is edible! This looks like really exciting food; hope they can change some of the issues and make it a place deserving of its stars. The meal wasn't bad, it's just that when taken in context with the other 3 dinners we had in the 4 day stretch (Benu, Coi and Saison, all 2 starred restaurants and all at which we had superlative meals), it disappointed in comparison. In our humble opinion, it would have been a standout one star restaurant, but now that it has been promoted, expectations are much higher and everything from the setting of the dining room, service and consistency of execution of the food has become more important than before.